Hi there friends! How are you? I'm home from my trip to see Nanette and her family. We had a lot of fun, chatting, sewing, going on outings, hanging out with her people, I LOVE IT. 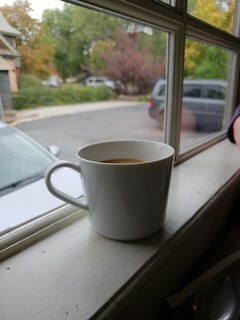 We had our usual farewell brunch on Sunday at Cucina in Salt Lake City. Usually it's Nanette, Dave, her husband, and I, but this time Jaime and Natalie joined us. The food is great and they make an amazing cup of coffee. It was a wonderful time. I love that it was cooler while I was there, fall in full swing. No snow though, it's the first time I've been to Utah where I haven't seen or been in snow at some point in the trip. The weather was so pleasant. I'm back home to some warm weather and it's unseasonably humid. GROSS. 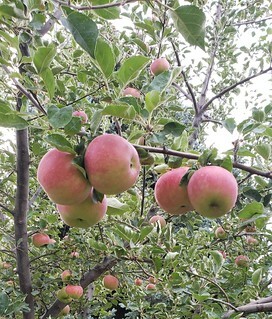 And no fresh apples to pluck straight from the trees. I would have brought some home but you can't get back into CA with produce. We had a great time sewing. 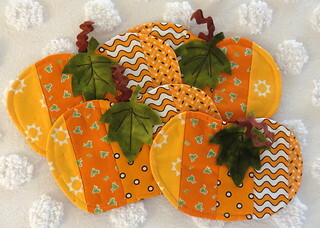 I worked on my Christmas project but we took a break and made some pumpkin mats for gifts. This required a couple of trips to quilt shops, I needed some oranges and we needed a bit of wool for the leaves. We drew our own pumpkins and leaves, so there's no pattern. It was a lot of fun. Came home to my Sew Stitching Happy box. I have never ordered a curated box before. I fell in love with the cute calendar fabric and HAD TO HAVE IT. It was just my good fortune that the box had a cute collection of fabric and notions that made it perfect to order. That little bag has a spool of thread and who doesn't need more thread? Anyway Cassie has a cute shop, I follow her on Instagram.